Approximately one in five Sims under my care will die in a kitchen fire. Those who survive will face an even bigger threat: smart speakers. The Amazon collaboration means The Sims 4 is the latest AAA title to debut on the Alexa platform, joining Skyrim. But, before we get ahead of ourselves, the Alexa integration isn’t a voice-controlled version of the game. Thankfully, it’s a separate experience. I don’t think anyone needs to hear Alexa describing how my Sim is asphyxiating on smoke and bile as flames engulf the entire southern side of his kitchen. Alexa-enabled device owners can play by saying “Alexa, play The Sims.” Once started, users can play a Sims trivia game solo or with up to four local players, listen to a playlist featuring more than 150 songs from the franchise, or hear interesting facts about the games. The music is surprisingly catchy. It includes hit songs in “Simlish” (the gibberish-sounding language of The Sims) by artists such as Katy Perry, Jason Derulo, and The Pussycat Dolls. Fair warning: you’re likely to get gibberish stuck in your head and people may think you’re having a stroke when you start spouting nonsense to the tune of a pop hit. But wait, there’s more. Whether you act now or not, the PC version of The Sims 4 now has an in-game virtual assistant named “Lin-Z” for your Sims to interact with. Sims can turn lights on and off, play music, order food and services, and play trivia games the same way you do: by spouting gibberish at an inanimate object. All jokes aside, it’s a sign of the times that a game released half a decade ago is getting updated to keep its characters from seeming like relics of yesteryear. Just about all of us have access to a virtual assistant, and most people use them at least semi-regularly. It’s pretty cool to see that reflected in the virtual world. This may not be The Sims 5 announcement we’re all waiting for, but it’s indicative of the level of constant support that EA and Maxis give the franchise. The addition of an in-game smart speaker and Alexa integration both signal the franchise’s caretakers continue to be forward-thinking. The first three words that my daughter spoke were “Mama,” “Alexa,” “Papa” – in that order. Alexa was part of our family and I adapted to find new ways to create enjoyable experiences for my daughter. My daughter “thanks” Alexa every time she plays the song of her choice – and YES it’s “Baby Shark” these days. Kids are being raised in a voice first world. It is not a novelty but norm for them. I am personally bullish on the role entertainment companies can have on creative new experiences using voice. Sims Alexa’s launch innovation is in connecting a brand with two decades of history with its audience: past and current. It also challenges what good looks like with the voice applications in the market today. The smart-speaker industry is still getting its feet under it despite phenomenal sales over the past two years. It’ll be interesting to see what role established intellectual properties play in the market going forward. 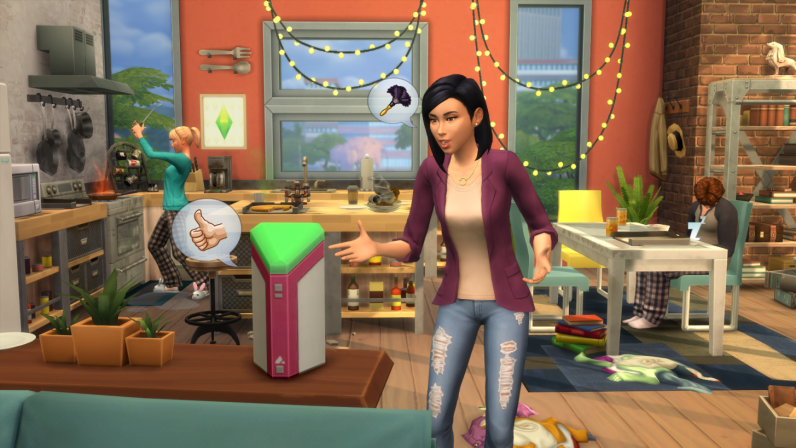 The Sims 4 Alexa integration (with a compatible Alexa-enabled device) and the in-game virtual assistant (on the PC version) are both available now. An obscene number of Sims were harmed in the making of this article.